Aaron’s specializes in discount furniture and electronics and helps people “own it”. The most important difference between Aaron’s and other stores is that Aaron’s gets it – They know you and don’t want to just lease furniture and appliances, you want to own it. In 2016 alone, hundreds of thousands of customers achieved ownership by leasing to own with Aaron’s without credit. Dufferin Custom Upholstery aims to please. Our goal is to make sure our customers are well taken care of and 100% satisfied. We offer outstanding upholstery services in a wide variety of materials for all your furniture. Call us to learn more about our services. Dynevor Furniture & Appliances Ltd has claimed its name by serving diverse customers within the local Fairbank Village community, offering incredible value for an unbelievably low price. The furniture experts at Dynevor Furniture & Appliances are constantly locating quality brand name furnishings at rock bottom prices to pass the savings on to the customer. Dynevor Furniture & Appliances offers Same Day Delivery on all In-Stock Items! 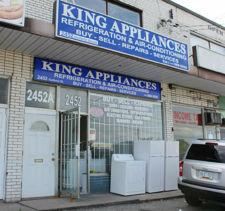 King Appliances sells used coolers, freezers, air conditioners, refrigerators, electric stoves, gas stoves, washers, dryers... you name it! They also buy, repair and service your appliances. KWA offers high-end Kitchen and household appliances from Wolf, Sub Zero, Viking, Perlick, True, Liebherr, AEG and many more. The company’s unique selling proposition is exceptional personalized service and the ability to troubleshoot clients’ renovation hurdles. Right Value Furnitures staff are friendly and able to deliver customized service! The store is well-laid out and easy to shop with a wide range of contemporary furniture including chairs, couches, tables and cabinets filled with knick-knacks and figurines. Vito Auciello Real Estate Corporation provides a full range of Real Estate services, specializing in unique investment properties, assembly opportunities, and development projects. The “Vito Auciello” Team is also associated with Architects and Engineers that can recommend related professions and trades-people to assist you with building permits and applications required by authorities.